Think of a tropical island in the Pacific Ocean. What springs to mind? Sunsets over endless horizons? Waving coconut palms and tropical fruit? Dolphins leaping into the air from crystal clear waters? Local fisherman in hand-carved canoes traversing a calm lagoon? Ah, all those things. Oh and cyclones. And tsunamis, earthquakes, volcanoes, landslides, flash floods … and more cyclones. I really do hate to spoil the romance but the beautiful countries that dot the Western Pacific really are among the highest risk in the world when it comes it natural disasters due to a cocktail of continental plate boundaries (which cause earthquakes) and a massive body of warm water (causing cyclones). In the first three months of 2018 alone, the Pacific was hit by Cyclone Gita (striking Samoa, Tonga and southern Fiji), Cyclone Hola (striking Vanuatu), a continuation of volcanic eruptions on Ambae (Vanuatu) and a series of massive earthquakes in Papua New Guinea. These natural disasters impact everything: houses, water supplies, roads and electricity systems, individuals, schools, government services … and — often more critically — health facilities. In disaster response, getting information to the right people as quickly as possible is absolutely critical. This is where Tupaia is helping. 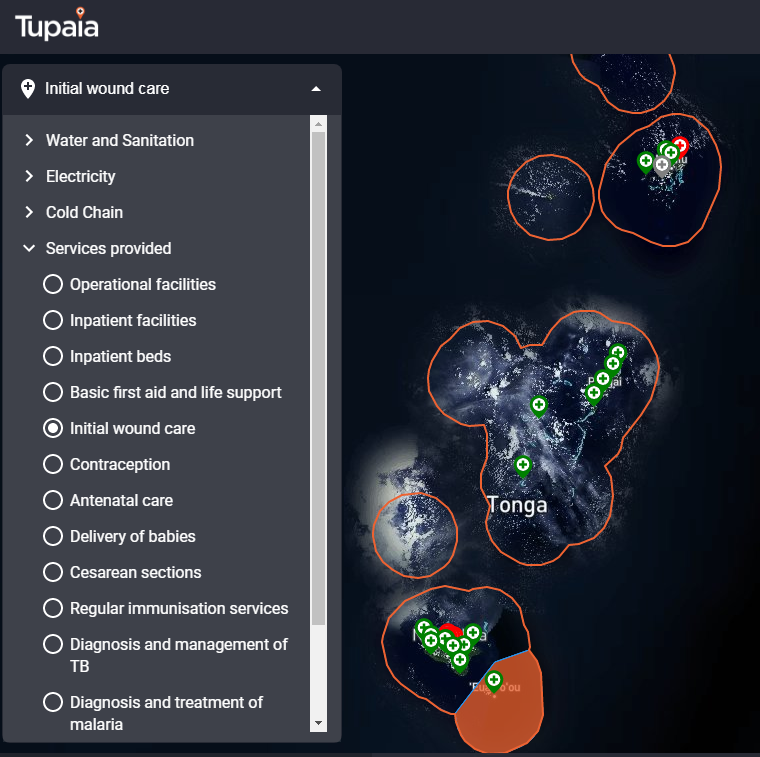 Tupaia provides a map pinpointing every health facility across six countries: Cook Islands, Kiribati, Solomon Islands, Tokelau, Tonga, and Vanuatu. When a disaster strikes, local and international response and recovery teams mobilise to assess the damage. These teams aim to restore critical services as quickly as possible — particularly medical care. Response teams and health staff can collect data offline, which will sync when the mobile device comes back into range. As soon as Tupaia syncs, the data is made available to local disaster response coordinators, donors and experts around the world. 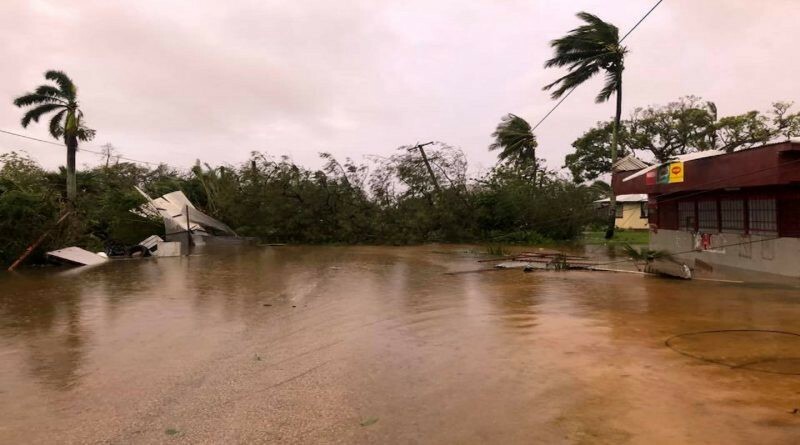 After Cyclone Gita struck Tongatapu in Tonga in February 2018, Tupaia was used to assess all health facilities in the wake of the huge storm. Within 48 hours, data had been collected from all seven facilities on the affected island. This could immediately be compared with baseline data collected several months earlier, so response teams could see how measures of water, electricity and available services were impacted by the cyclone. The Tupaia app also allowed pharmacy staff to take photos of the damage, which could be compared with photos taken at the baseline stage. Live dashboards were made available to the Ministry of Health and incoming response teams from Australia and New Zealand and they were able to use that information to quickly plan their response and direct resources. What’s more, this process ultimately saved money. The rapid assessments showed the damage to health facilities was, in fact, minimal and that resources should be directed towards communities and other public infrastructure (including water supplies) that had suffered much worse damage. Tonga suffered widespread damage from Cyclone Gita in February 2018. Source: Reuters. In Tonga, Tupaia helped maintain confidence in the health system and prevented an influx of unneeded medical teams and equipment. It might seem counterintuitive, but this certainly demonstrates that showing data on a lack of damage can be just as valuable as showing the damage itself. Collecting data isn’t new, of course. But the problem has been that different people use different tools and old-fashioned datasets are difficult to track. Which is the most recent version? Where is the baseline data? Which services were available BEFORE the disaster? Who actually collected this data and when did they do it? Sometimes, response teams can spend more time answering these questions than – well – responding. Tupaia provides a ‘source of truth’ for the people that need that information. It collects standardised data from hundreds of facilities and makes it available through customisable, accessible, free online dashboards. Tupaia is also able to instantly see who has gathered the information, when it was collected and whether it corresponds with existing, known pre-disaster information. This saves response teams hours, sometimes days, of valuable time, and lets them get stuck into their job. Tupaia also provides a regional map covering six countries. We aim to expand this service to cover the entire Pacific. Disasters cross national borders, so data needs to be available to neighbouring countries. Who would need this data? It’s particularly valuable for the focal points at the national Ministries of Health. But external groups are welcome to use it too: donors like Red Cross and Medecins Sans Frontieres, and government agencies like Australia’s NCCTRC. But most importantly, it’s for the patients who need to know which services are still available and which facilities can be accessed most quickly: the people of the Pacific. More than ever, it’s crucial the region is prepared. Unfortunately, the prevalence and intensity of a lot of natural disasters in the Pacific are set to worsen. For cyclones, this is as climate change accelerates and global sea temperatures rise. The impacts of landslides, earthquakes and tsunamis are also worsening, thanks to coastal erosion and deforestation in unstable, mountainous areas. We’re continually working to improve the disaster response capabilities within Tupaia to make sure that only the most relevant and meaningful data is being collected (in emergency situations, asking meaningless questions can cost valuable time). We are aware many people using www.tupaia.org post-disaster are accessing the website for the first time, so we are also working to make sure all maps and dashboards are clear and intuitive. Check out www.tupaia.org and feel free to make suggestions! We’re also keen to hear from more potential disaster response partners, so if you know of any, please put us in touch. We’re hoping to expand Tupaia to the remaining Pacific Island countries by the end of 2018. This will make Tupaia the most comprehensive, geographically largest, multinational disaster preparedness mapping resource in the world. This resource is available to all Pacific Island countries for free. Let’s make the most of it for the benefit of the wonderful people who live there. Note: This is not to say that health facilities suffered no damage from Cyclone Gita but overall the buildings stood up to the Category 5 storm remarkably well — some smashed windows and minor water damage were noted, which could be appropriately triaged for when other issues had been addressed.